Obituary – Davidson, LuElla (Grim) « Perry High School Alumni Association, Inc.
﻿Red Hots 50-51; Student Council 50-51; Office Staff 53-54. 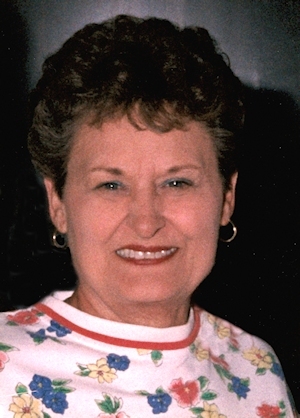 LuElla Davidson, 62, member of the First Christian Church, passed away, at 10:55 a.m. Friday August 6, 1999 at Integris Health Baptist Medical Center in Oklahoma City. Funeral services will be held at 10 a.m. Tuesday, August 10, 1999 at the First Christian Church in Perry. Rev. Lynn Scott will officiate. Interment will follow in the Grace Hill Cemetery under the direction of Brown-Sisson Funeral Home. Public viewing is scheduled from 8 a.m. to 6 p.m. Monday, August 9, 1999 at Brown Sisson Funeral Home. LuElla was born November 12, 1936, in Perry, to Loyd and Joyce (Willhelmns) Grim. Pallbearers are Walt Freese, Joe Sewell, Marvin Hasenfratz, Stuart Jeffery, Randy Edwards, and Loyd Brown. LuElla was preceded in death by her father, Loyd Grim. She is survived by her husband. 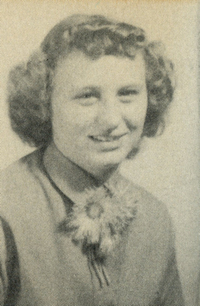 Gene Davidson of the home; two daughters and sons-in-law, Janet and Sid Wilhelm, Perry and Judy and Bill Yetter, Edmond; a son and daughter-in-law, Gerald and Melanie Davidson, Perry; five grandchildren, Russell Davidson Caldwell, Haleigh Ann Davidson, Natalie Kaye Davidson, Christie Jean Yetter and William Heath Yetter; her mother, Joyce Grim, Perry; her sister and brother-in-law, Tom and Louise Johnson, Perry; her brother and sister-in-law, J.D. and LaNese Grim, Benton, AR. The following information is a reprint of an article published in the Perry Daily Journal November 16, 1990 edition. The headline read “LuElla Davidson Named Citizen of the Year.” Here is the complete text of the announcement made by Lloyd Brown that LuElla Davidson had been chosen Perry’s Citizen of the Year in 1990. Brown was recipient of the award for 1989. Long before “I Love Perry” buttons were distributed to promote pride in Perry, Perry had a goodwill ambassador that was telling everyone she met about her wonderful home town of Perry, Oklahoma. Tonight we honor a person who has spent endless hours helping to make Perry a truly wonderful town – LuElla Davidson. Born and raised in Noble County, LuElla spent her youngest years in the Billings and Red Rock communities before settling in Perry as an elementary student. She graduated from Perry High school and has been a Perry resident and supporter ever since. LuElla married Gene Davidson on September 15, 1953. (Surely the Cherokee Strip September 16th celebration will help Gene remember his wedding anniversary,) LuElla and Gene have three children – Janet Wilhelm of Perry, Gerald Davidson of Perry and Judy Yetter of Yukon, Oklahoma. LuElla and Gene have two grandchildren, Russell Davidson Caldwell, age 7, who sang earlier tonight, and Haleigh Anne Davidson, age 11 months. Haleigh Anne is not yet singing publicly; however, we suspect “Grandma” will try to get her involved in something real soon. LuElla’s involvement in our community has reached out to our young people and adults alike. She has been involved in the Red Ribbon Drug-Free committee and the Perry elementary school Self-Esteem Program. She continues to be an active supporter and contributor to the Bloodmobile project and the Perry United Fund. LuElla is a founding member and past president of the Perry Elkettes organization which, among many other projects, has annually supported the local and state Special Olympics program for handicapped youth. LuElla has been an active supporter of the Perry Chamber of Commerce for many years and served on the Board of Directors from November of 1987 thru October of 1990. In the mid-1980s, when some people were “singing the blues” about our retail economy, LuElla organized and promoted a “Welcome to Perry” committee to greet newcomers to our community. In addition to a social greeting, LuElla promoted our local businesses by giving each newcomer information and promotional items from our local businesses. LuElla has served as a tri-chairman of the Chamber Retail Committee” and has helped chair various retail promotions including the “Halloween Promotion,” “Springfest,” and “Crazy Days” promotions. She has been active in various capacities in promoting and organizing our annual Cherokee Strip Celebration. LuElla’s love of country and western music has also been beneficial to our community, in 1986, she organized the first street dance for the Cherokee Strip Celebration. When she first presented her idea to bring Hank Thompson to Perry to play for the dance, many people told her that the cost would be prohibitive. In her typical style, she promptly went to work and raised the necessary funds from contributors without hampering the Chamber budget. Literally thousands of people had an enjoyable evening because LuElla refused to believe that it couldn’t be done. She has had the opportunity to meet with other country and western stars such as Charlie Pride, the Gatlin Brothers, Lee Greenwood, and many others. In each instance, she has used the opportunity to promote Perry, Oklahoma, as a great place to live and visit. After hearing complaints about the poor sound system in the Courthouse Park during the 1990 Cherokee Strip Celebration, LuElla promptly went to, work to raise the funds, necessary to install a quality public address system. By enlisting the assistance of several other people LuElla has made it possible for future events to be heard in the Courthouse Park through a first class sound system. One person has said that LuElla doesn’t realize that some things can’t be done – and as a result she sets out to accomplish what others may deem as impossible. Another has said that LuElla is a joy to work with – always energetic, informative, and fun. LuElla’s first devotion is to her family; but if she has a hobby, it must be described as making Perry a fun, caring, and safe community for all our citizens. It is with pride that the Chamber of Commerce and the entire community honors LuElla with the “Outstanding Citizen of the Year” award for 1990.